One packet of Mission wraps or frozen Chappati. 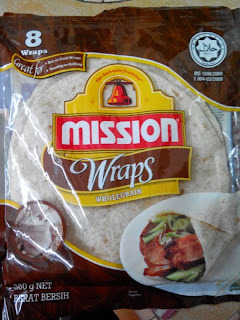 I got a packet of wholemeal Mission wraps but you can also use the frozen Chappati you can find at grocers/Hypermarkets/supermarkets. 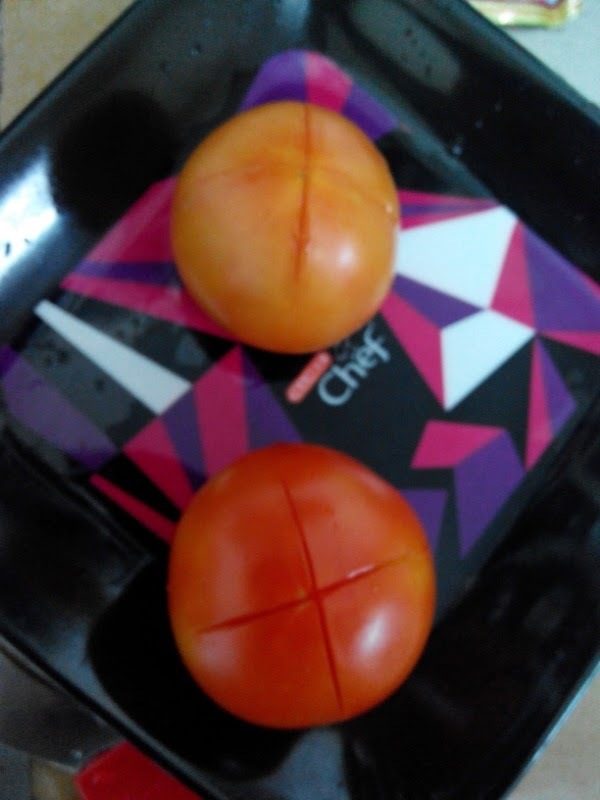 Then you have to prepare the tomato sauce. You will need a big onion, some garlic, tomatoes, tomato puree. Chop or dry blend the onions and garlic. As for the tomatoes, cut an 'X' on the bottom and put it into boiling water for a minute or two so you can easily peel the skin off. Then cut it into four and remove the inside seeds and all. Then chop it up or add it into the dry blender. Heat the oven. I use a small oven and put mine at about 200 degrees to heat up. Pour olive oil into saucepan and put in the onions/garlic/tomato combination and stir till fragrant and add tomato puree. Stir until sauce thickens. The sauce must not be too watery so don't add any water. Once sauce thicken you can shut the fire. 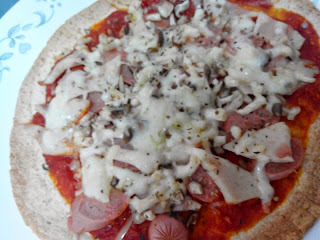 I keep half the sauce in the freezer to be used at other times as there was a lot of it and you only use a bit for your pizza.. 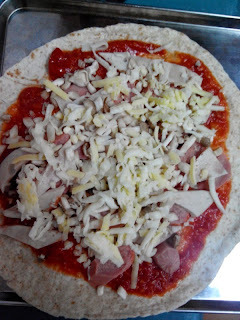 Put the sauce thinly over the wrap or chapatti. Chop up your ingredients. Any vegetables(asparagus, mushrooms, pineapple, kale, carrots) or meat (sausages, meat loafs, pepperoni) or seafood (tuna , crabstick) . I choose to put some mushrooms and also half a sausage and half of a meat loaf on my 'pizza'. Then sprinkle cheese on it. You can get the ready grated mozzarella and cheddar cheese from the supermarket or even the pizza topping cheese packet from Emborg from some supermarkets. Then sprinkle some Italian herbs (Thyme, Basil, Oregano) and black pepper on it and pop it into the oven for 10 mins.